What's your favorite classic family holiday movie? Whenever I think about this question I always tend to forget about It's the Great Pumpkin Charlie Brown. I don't know why I forget about it, I've seen it what seems like a thousand times. It's such a great movie, but I whenever I think about Peanuts or Snoopy I always skip ahead to A Charlie Brown Christmas. This year, I wanted to make sure that I didn't make this mistake so I made a fun Snoopy Halloween lunch in an Easy Lunch Boxes container. It's complete with a Great Pumpkin sandwich! Read below to find out how to make it for your own family. We've all been there. Our young child loses their tooth and it's the most important thing in the world...well for that day anyway. The only problem is that, as the parent, I of course forget to have the Tooth Fairy visit during the night. Well, maybe this new book by Mo Willems can help ease the pain. Unlimited Squirrels in I Lost My Tooth! is a fun and fast paced book about a squirrel who loses his tooth and his friends who try to find it. It reads pretty quickly and one of our favorite parts are the sections with "A-Corny Jokes!" We loved it so much that I had to make a lunch recipe (and include the acorns). In the book there are also facts about teeth, and of course the story itself. My boys seriously want to read this book every night before bed. I can't wait for the next books in the new series to be written. 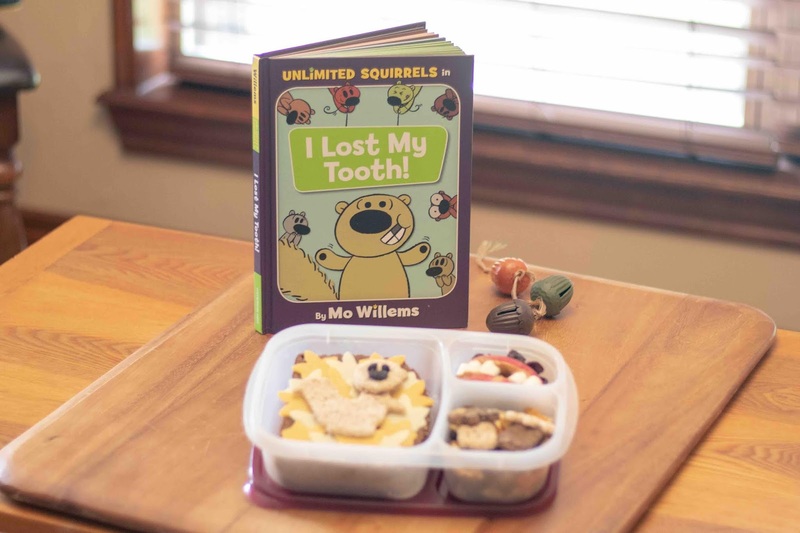 You can find the first book,- Unlimited Squirrels in I Lost My Tooth! on Amazon HERE, and my lunch recipe down below! 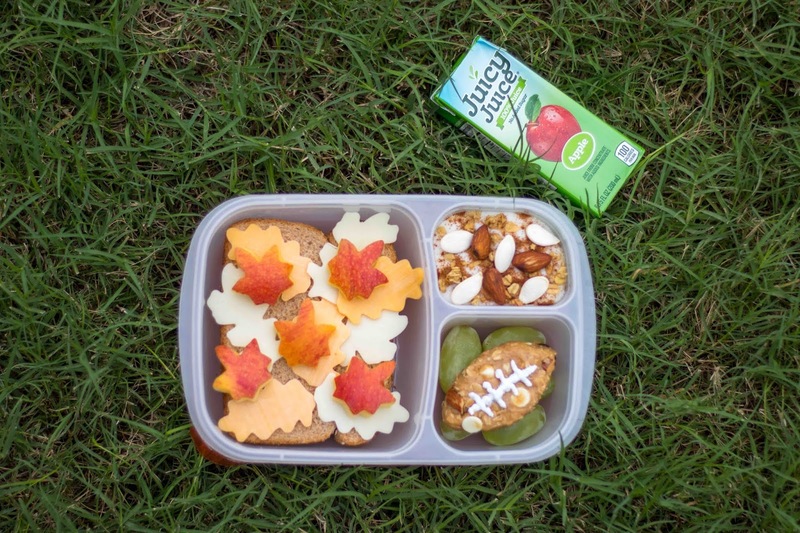 How to Make a Fall Football Lunch PLUS BONUS Halloween Snack Ideas! This is a sponsored post in partnership with Juicy Juice. All opinions are my own. It's that time of year again. You know what I'm talking about. Boots and scarfs awake from their summer slumber, school is back in full-force, everything is pumpkin spice, the leaves magically change, apples become the go-to-fruit, and football takes over the weekends. Fall really is a fantastic few months! In order to properly celebrate this season, I had to make this Fall Football Lunch complete with a side of Juicy Juice 100% Juice. If you are going to experience Fall, you need to do it right! 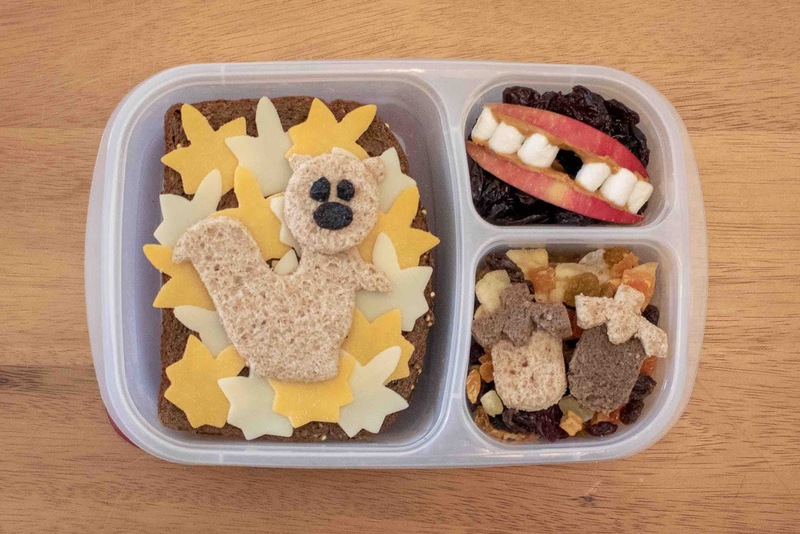 Each one of the elements of this lunch symbolizes something fun for our family. First of all, we love collecting multicolored leaves to create beautiful crafts. Kids can do incredibly creative things with them. Football is also a favorite in our house. I would brag about our team, but let's just say that there's not much to brag about right now. It's still fun to make a no-bake football granola bar though. Our family also is susceptible to the lure of all the pumpkin spice flavored food as well. That's why we came up with the idea of a yogurt bar where our kids could load this side dish up with the Fall toppings of their choice. 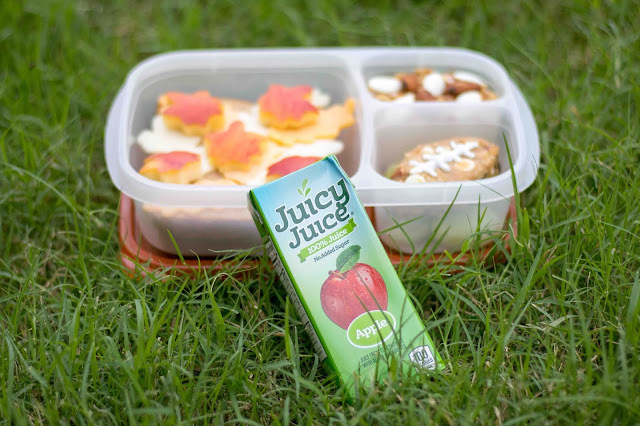 Since this time of year is also known for all things apple, no Fall themed lunch would be complete without Juicy Juice 100% Juice, Apple flavor! We feel good about using Juicy Juice because it is 100% real juice with no added sugar or artificial sweeteners. Check out the recipe below for how I made this lunch! 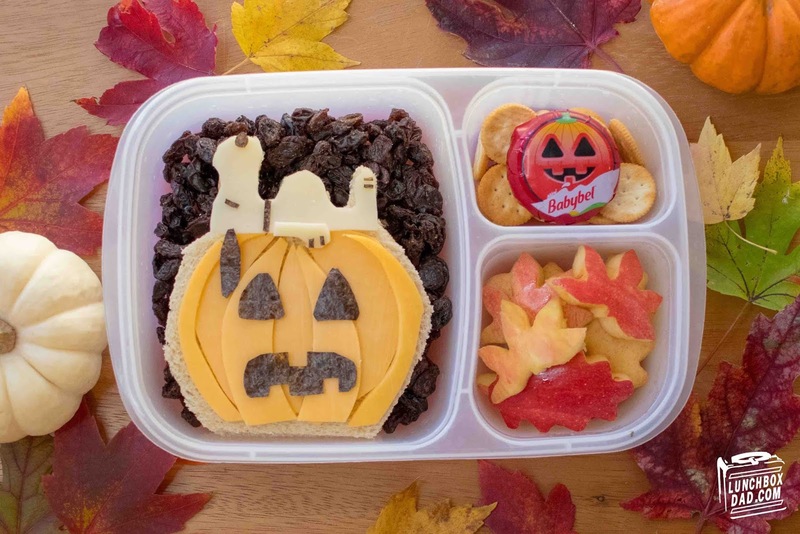 Scroll Down For Bonus Halloween Snack Ideas! You can't talk about fun family Halloween movies if you don't include Hotel Transylvania on that list. My kids were begging to see the newest movie all summer long. The series is just good natured and hilarious. As far as comedic monster movies go, Hotel Transylvania hits the mark for sure. My favorite character might be Blobby, but my kids love Frank, Winnie, and of course Drac. 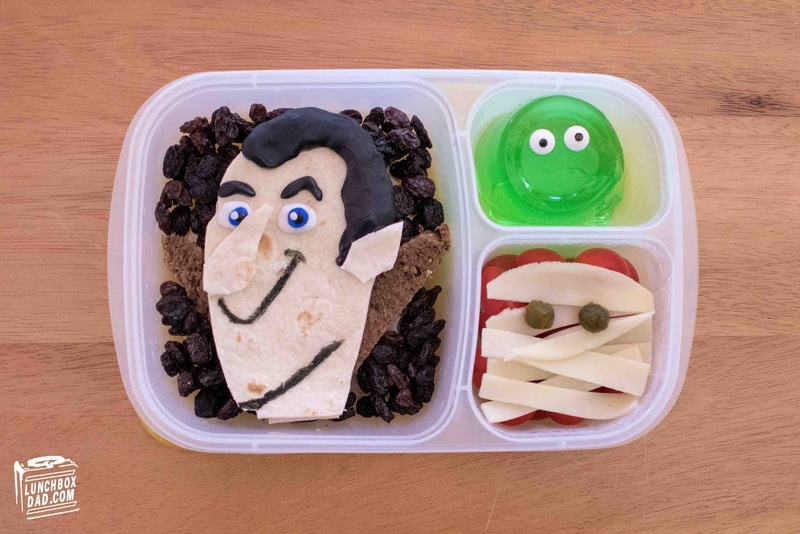 So I figured that I have been making fun lunches long enough that this lunch was long overdue. I made this lunch an Easy Lunch Boxes container. One tip is you will want to leave the fondant in a separate container overnight or it will start to "melt" on the tortilla. Do the same thing with the candy googly eyes on Blobby. It will only take a second to assemble it in the morning. It is also always fun to watch one of the movies before you make the lunch for them. You can never go wrong with spending some family time together and then reminding your kids of it the next day with a fun lunch! Keep reading for the entire recipe.